Beach table favors include beach salt and pepper shakers and spreaders. Beach table favors can be used to decorate tables and the guests can take them home as favors. Beach table favors are a perfect choice for small and large beach themed events. 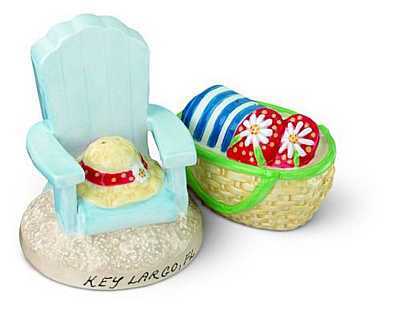 This really cute adirondack chair and beach bag ceramic salt and pepper shakers and handpainted. They are really great for beach wedding favors and beach wedding table decorations. The adirondack chair and beach bag salt & pepper shakers can easily be personalized with a fine point permanent marker. We can personalized them if you order 6 or more. 2-3 weeks for personalization. Price is per set. ~ 5"
These beach pail salt & pepper shakers and perfect for beach wedding favors and beach table decorations. The 2 sand pails have a holder that can be personalized with a fine point permanent marker. We can personalize them if you order 6 or more. 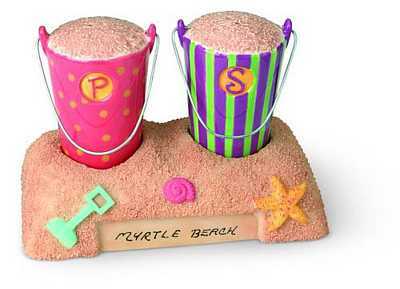 Each beach pail salt & pepper set is ~5", handpainted ceramic. Price is per set. 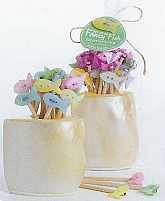 These mother of pearl fish toothpicks are pastel colors and so cute. There are 24 fish toothpicks in a mother of pearl holder. Price is per set of fish toothpicks. These make great beach wedding favors or beach decorations. Flip flop salt & pepper shakers are perfect for beach wedding favors or beach decorations. They are the cutest little salt & pepper shakers that you will ever see! The flip flop salt & pepper shakers are handpainted and ceramic. ~4". They are easy to personalize with a fine point permanent marker. If you order 6 sets or more, we will personalized them for you. 2-3 week lead time for personalization. The price is per set of flip flop salt & pepper shakers. 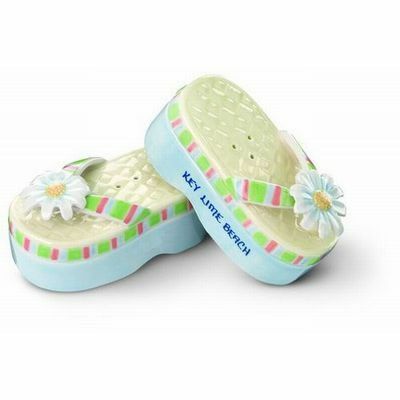 Flip flop salt & pepper shakers are perfect for beach wedding favors or beach decorations. They are the cutest little salt & pepper shakers that you will ever see! 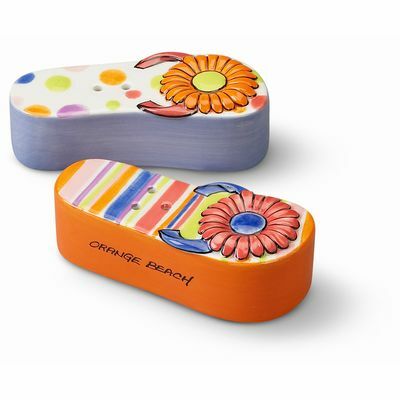 The flip flop salt & pepper shakers are handpainted and ceramic. ~5". They are easy to personalize with a fine point permanent marker. If you order 6 sets or more, we will personalized them for you. 2-3 week lead time for personalization. The price is per set of flip flop salt and pepper shakers. These luau shirt stand-up napkins are the perfect addition to your table decorations for weddings, beach parties and bridal showers. They actually stand up and they are real napkins. These eco-friendly napkins are made in the USA of 100% recycled tissue and FDA approved food grade inks. Each set of 16 napkins are packaged in a translucent boxes. 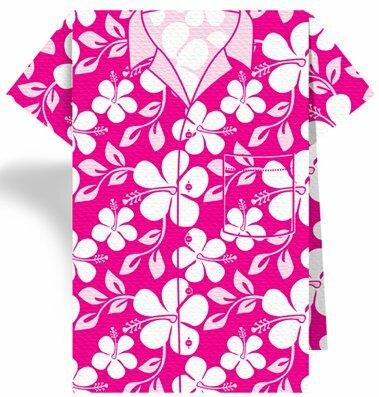 The price is per pack of 16 luau shirt stand-up napkins. Shell Toothpicks The seashell toothpicks are perfect for any beach themed event. 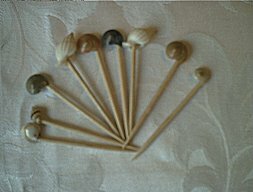 Price is per set of 100 shell toothpicks. 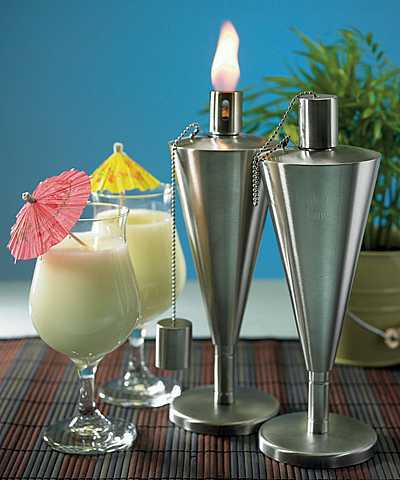 Stainless Steel Outdoor Torch The Stainless Steel Torch makes a great gift for anyone who loves entertaining outdoors. Engrave with a personal message to create an extra special gift. Oil not included. 10-1/4" Tall. Engraving is extra. If engraving, add your personalization in the comment field below. Names and date. Price is for 1 stainless steel torch. Personalized Buoy These personalized classic cedar wood buoys are the perfect gift for the water loving couple. The personalized buoy are also great to display at the bride and groom's table or at the entry of the reception. They also make great beach centerpieces. Limit 10 letters on the top and 10 letters on the bottom. Limit 3 letters on either side. Put your personalization in the comment field below. They are ~11"H x 5"W .Please allow up to 1-2 weeks for delivery. Price is per personalized buoy.